I can't believe I'm only writing about this now! Etude House's Drawing Eye Brow is one of my favorite brow products EVER along with the Easy Brow pencil (also from Etude House) and the In2it brow kit. I can't not write about it. Scroll way down to my oldest posts and you'll see how bad my brows were before. It took me years (and lots of YouTube videos) to figure out how to properly groom my brows. I'm actually still learning! The first ever brow product that I really liked was the Etude House Easy Brow pencil in shade #4. Yes, the shade had to be mentioned because the first time I tried the same pencil, it was in a different, browner shade, and I ended up not liking how my brows looked with it. I thought it was the product itself, but with a little help from a blog post I saw, I realized I was just using the wrong shade! So I gave the pencil another try but in a different shade this time, one that's a closer match to my hair color - #4 Dark Gray. I used it together with the In2it brow kit and ended up loving that combo. And that's when my love affair with Etude's brow pencils started. Fast-forward to when I decided to try the also well-raved retractable, angled Drawing Eye Brow instead of repurchasing the Easy Brow. And booooy, was that a good decision! Not that it's better than the Easy Brow. They're both great pencils, and I love them both. I like using the Easy Brow-In2it combo when I'm going for more defined and neatly-outlined brows, and I like using the Drawing Eye Brow for everyday, casual looks because I can just slap it on and go. Ok, that's the longest intro ever, I almost forgot what my point was. Anyway, let me tell more about this Drawing Eye Brow pencil. The lead itself is very short. It's just about the length of the cap. I wish it were longer, but this can already last me for months! Just be careful not to drop this, though, because the lead breaks easily. Being the klutz that I am, I have dropped my Drawing Eye Brows lots of times, and the lead of each broke after the first drop. This is why I can't carry it around in my makeup kit like I can with the Easy Brow. I know Etude House sold refills of this. I think they still do, but it's always out of stock and I haven't seen one in forever! Even the not-refill Drawing Eye Brow and the Easy Brow... SO HARD TO COME BY THESE DAYS. K fine, Etude. Don't stock up on the items I actually want to spend money on. Up to you. There's a spoolie at the other end of the pencil, too. And it's actually useful, at least for me. No need to pick up a separate brush just for blending. After a long time and lots of trips to Etude House and a few wrong-shade purchases, I have figured out that the perfect Drawing Eye Brow shade for me right now is 02 (gray-brown). Thing is, that shade is the most elusive! When you see one, GET IT. I can also do with 05 (light gray), but that can be a little too gray for me sometimes, especially since my hair still has a hint of brown from my last coloring sesh. For me, it's either 02 or 05. But 02 is still the best. The pigmentation of these pencils is just right for me. I don't like using super pigmented brow pencils! It's easier for me to build up color than to erase when too much is applied. With these, I can spend just two minutes on my brows and go. 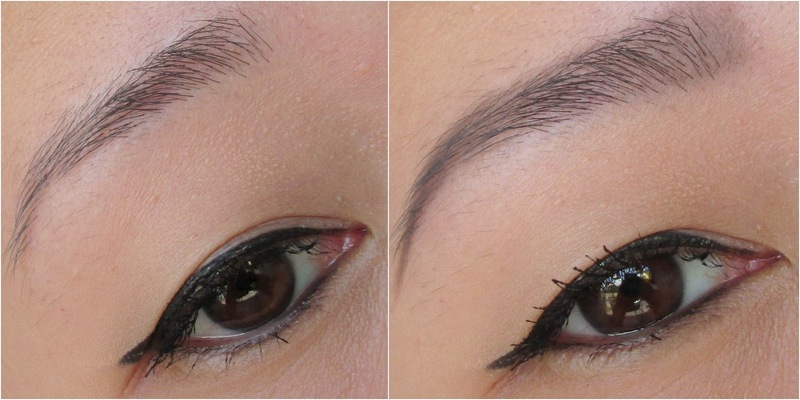 Here's how the Drawing Eye Brow pencil (02) looks on me on a good brow day. I also love how it stays put the whole day 'til I take it off. Yes, even after hours and hours in the office and long commutes! 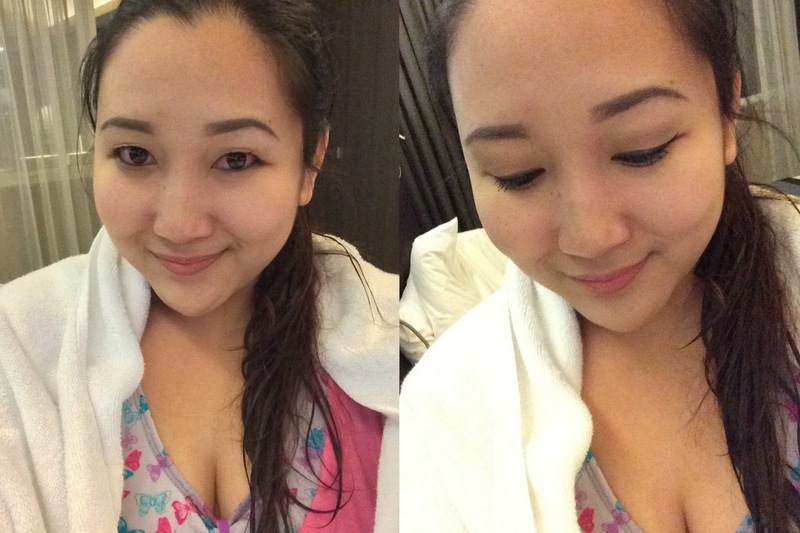 I was even able to babad in the pool without my brows fading completely. I was careful not to rub my face, though, and I didn't really swim (babad lang po talaga, hindi ako marunong lumangoy haha), so I guess that's also a factor. But still. That's good enough for me. It doesn't easily come of when I accidentally brush my brows with my hand, but it's also not a pain to take off. It comes of really easily with wipes or even facial wash.
Love how it looks on my brows! Although there are a lot of Etude House branches nearby, this is still hard to repurchase because it's almost always out of stock, especially shade 02! Can't say enough how much I love the Drawing Eye Brow pencil. I hoarded all remaining stocks of 02 a few months ago when I finally caught it in stock at Trinoma. If the lead were a little less fragile, I'd love this even more! I love this product. I bought one when I was in the Philippines 2 years ago but I ran out. I should have bought more. It's super cheap! I must check these beauties soon! Thanks for the review! Same here, nagbabad lang ako last time swimming namin, can't swim. haha! Nope, it's not available here in the Middle East. I should hoard everytime I come home to the Philippines. This sounds so cool and I've been meaning to try new brow products and I just love Étude so I'll look into H&M next time I go to the mall.